BEIRUT The powerful Shiite militant group Hezbollah, a close ally of Syria, said Tuesday it opposes calls to hand over the investigation of the assassination of an anti-Syrian intelligence official to the international tribunal probing similar killings of other Lebanese political figures. The most prominent case before the Netherlands-based tribunal is the 2005 assassination of former Prime Minister Rafik Hariri, who was the country's leading opponent of Syrian involvement in Lebanon at the time. Syria dominated Lebanon for decades until it was forced to withdraw tens of thousands of troops in 2005 amid a backlash over Hariri's killing by a massive truck bomb. Some anti-Syrian politicians have called for the investigation to be referred to the international tribunal in the aftermath of Friday's car bomb that killed intelligence officer Brig. Gen. Wissam al-Hassan. "Any attempt to give an international dimension to this case will not do anything to this case," Hezbollah's deputy leader Sheik Naim Kassam said in a statement released by the group. "This is a Lebanese affair and under the authority of Lebanese laws." On "CBS This Morning" Monday, CBS News senior correspondent John Miller - a former deputy director in the Office of the Director of National Intelligence - said nations that are supporting Syrian opposition groups are finding themselves to be targets of al Qaeda-inspired militants. Also Monday, the FBI confirmed to CBS News that its personnel was heading to Beirut to assist Lebanese officials in investigating al-Hassan's death. The U.N.-backed tribunal indicted four Hezbollah members in the killing of Hariri and 22 others. Hezbollah, which along with its allies dominates Lebanon's government, denies involvement. Al-Hassan was very close to Rafik Hariri's son Saad Hariri, also a former prime minister. He was once in charge of security for Rafik Hariri and later investigated Hariri's killing. The assassination on Friday, blamed by many on the Syrian regime, has stirred up sectarian violence in Lebanon where people are deeply divided between supporters and opponents of President Bashar Assad's government in Damascus. Syria has intervened heavily in Lebanese affairs over the past decades and is blamed for the deaths of many prominent critics and anti-Syrian political figures. Al-Hassan challenged both Syria and its powerful Lebanese ally Hezbollah. Seven people have died in clashes between pro- and anti-Syria factions sparked by the assassination  the deadliest violence in Beirut in four years. Late Monday, the police chief released details of the investigation into al-Hassan's assassination, describing a carefully planned car bombing that targeted the intelligence officer as he was moving about the capital in secret. Al-Hassan was one of Lebanon's most secretive figures, and until his death many Lebanese did not know what he looked like. "The martyr Wissam had an appointment in this office and it seems he was watched," Rifi said, adding that the booby-trapped car went off as al-Hassan's car was passing slowly by through the narrow street. The secret office in the predominantly Christian neighborhood of Achrafieh is few hundred yards away from the heavily fortified police headquarters where al-Hassan spent most of his time while in Lebanon. Rifi confirmed that an FBI team will arrive to help in the investigation in the next two days. FBI teams helped investigate several bombings in Lebanon since 2005. A senior security official, speaking on condition of anonymity because he was not authorized to talk to the media, said al-Hassan entered through Beirut's airport using a fake name and after he reached his office, he sent his passport to the airport to be stamped. The official said this could be one of the ways it became known that he was in Lebanon. "The airport in Beirut is overrun. This airport if full of Hezbollah's gangs who bring into Beirut whatever they want," legislator Khaled Daher, one of the harshest critics of Syria and Hezbollah, told the local LBC TV. "I said from the beginning, who killed General Wissam al-Hassan and was behind the terrorist attack? They are the Syrian and Iranian regimes through the hands of Hezbollah." "This was a persistent and professional act against the (country's) most important security body. They were able to reach general al-Hassan," Daher said. The daily As-Safir reported that security authorities now have the data of al-Hassan's mobile phone and are checking it specifically from the time he landed in Beirut until he was killed. His last call was to Saad Hariri, telling him he was in Beirut, the paper said. Al-Hassan's work led to the arrest of former Information Minister Michel Samaha, one of Syria's most loyal allies in Lebanon. He is accused of plotting a wave of attacks in Lebanon at Syria's behest. Syrian Brig. Gen. Ali Mamlouk, one of Assad's most senior aides, was indicted in absentia in the August sweep. The assassination has dramatically escalated political tensions and sparked violence between supporters of Assad and his opponents. Lebanon and Syria share similar sectarian divides that have fed tensions in both countries. Most of Lebanon's Sunnis have backed Syria's mainly Sunni rebels, while Lebanese Shiites tend to back Assad, who belongs to the minority Alawite sect  an offshoot of Shiite Islam. Angry protesters tried to storm the government palace after al-Hassan's funeral on Sunday, venting their rage at leaders they consider puppets of the Syrian regime. But they were pushed back by troops who fired their guns in the air and filled the street with tear gas. Mikati later referred al-Hassan's case to the Supreme Judicial Council, which handles political and state security crimes. Mikati later left to Saudi Arabia to perform the annual Muslim pilgrimage, or hajj. Meanwhile, calm returned to the streets of Lebanon's capital, a day after troops launched a major security operation to quell fighting touched off by the assassination. Troops conducted major operations on Monday to open roads and force gunmen out of the streets. Schools and businesses opened as usual. 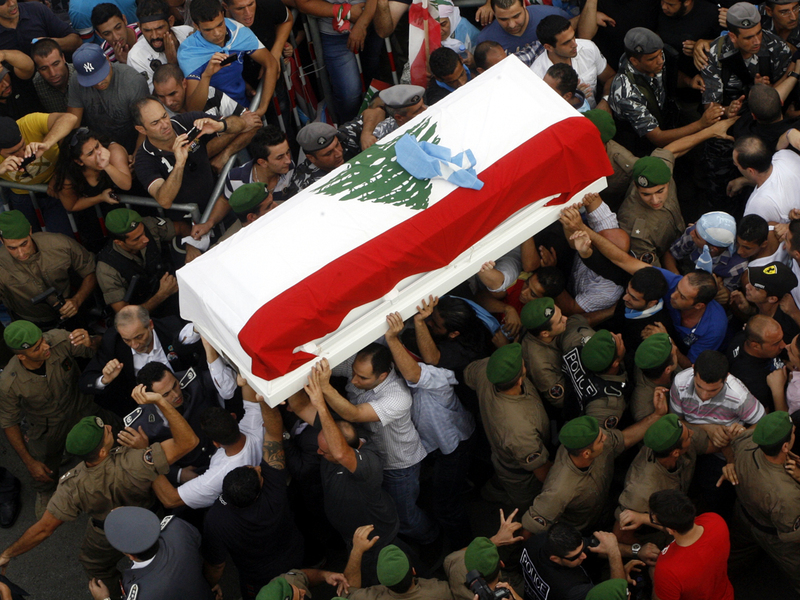 In Beirut, a funeral was held for Ahmd Queider who was killed a day earlier. Gunmen fired heavily in the air as hundreds of people marched behind the body draped in green and carried on a stretcher toward the cemetery.